Rigid Transport, located in Goldsboro, NC, is a family owned truckload flatbed carrier and logistics management company. We offer both 48′ and 53′ open deck equipment and provide service to two thirds of the United States. Rigid Transport also operates southeast regional fleet providing time-sensitive service to it’s customers. In these operational markets, Rigid Transport hauls primarily steel products and building materials serving high-volume, time sensitive shippers. We welcome you to consider us as a partner in your plans. If you can provide the truck, that’s great. If not, we offer a short term walk-away truck lease program or other lease purchase options. You can pull your trailers or we can provide you with a trailer. If you need additional securement equipment to get started, we have a purchase and no interest finance program to help you out. Whatever the challenge, Rigid Transport is dedicated to making things happen for it’s customers and owner operators… the kind of hands-on partners you’d want for your business. We are proud of the relationships formed in the past and we think you’ll be proud to work with us, too. Come and get to know us! 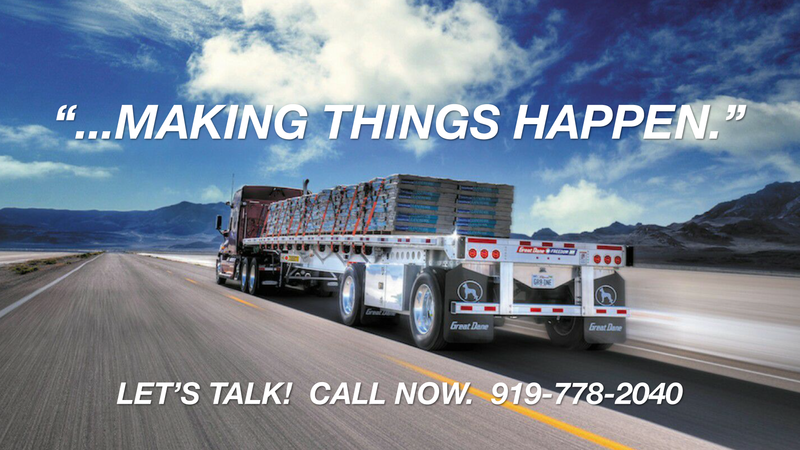 Located in Goldsboro, NC, we’re a family owned truckload flatbed carrier and logistics management company. We offer both 48′ and 53′ open deck equipment and provide cargo service to two thirds of the United States. Come and get to know us!